Meanderings along Ancestral Polytheist Paths: How to know? I recently finished reading a book by Stuart Piggot, "The Druids " and thought the information presented therein was reasonable, discussing what is known about the historical druids, with a little rant at the modern movement beginning with the romantics. The book was written in 1974 and was a slim, paperback volume, and written in an easy to digest style. 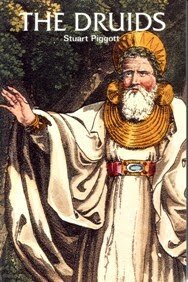 "There are two pieces of Celtic gnomic or proverbial wisdom recorded by the classical writers, and one attributed specifically to the Druids, that deserve comment here. Diogenes Laertius attributes to 'Gymnosophists and Druids' certain 'riddles and dark sayings', 'teaching that the gods must be worshipped, and no evil done, and manly behaviour maintained'. This is a statement in typically Celtic triadic form, and it is interesting to find what must be another version of it in an Irish tale, The Colloquy of the Elders, which dates from the end of the twelfth century, but may incorporate earlier material. Here St Patrick talks to one of the old pagan Celtic heroes, Caelte, and asks him: 'Who or what was it that maintained you so in your life? '; to which comes the answer, 'Truth that was in our hearts, and strength in our arms, and fulfilment in our tongues' – essentially the same three qualities in slightly different order." I couldn't figure out how the author thought these two statements were similar in any way. I posed the question on a few forums, hoping for some answers, all the while feeling I was being stupid. So far, the responses I have had tell me I was not being stupid and the author is making a connection where there isn't one. Now, I am questioning if there are other parts of the book I shouldn't trust. But, how am I to judge? I have no background in archaeology, history, linguistics or any other field which might allow me to discern the truth. How do other, non-academic people like me manage this? I read what I can, but obviously if I can't evaluate the information critically, I might be treading down the wrong path. I want to learn the truth, as far as we can know it today, but I am finding I am getting lost in the mire because I am unfamiliar with the landscape. As far as I know (and I hope this helps) Stuart Piggott's book is still seen as the standard work on Druids. I trained as an archaeologist, and I don't know of any better introduction to the subject. He sticks to what is actually known from written sources and archaeology and doesn't go off into flights of fancy. However, you're quite right about the quotation you highlighted - there doesn't seem to be much correspondance between the two statements. Thank you Eigon for your response. It is very much appreciated.